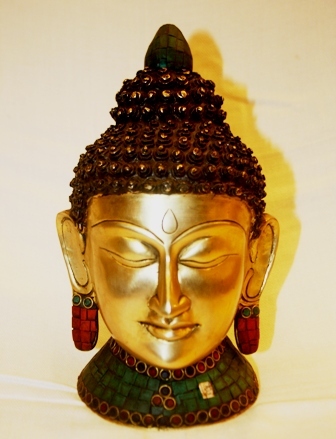 BUY BUDDHA HEAD, 10 INCHES GAUTAMA BUDDHA IDOL IN EXQUISUITE HAND CRAFTED BRASS, EMBELLISHED WITH TURQUOISE AND CORALS. Buddha head;The Zen Icon ! Buddha idol from Buddha Bazaar! Product no. BS013 is a finely carved, Brass Buddha Head Statue of Shakyamuni Buddha (also known as Gautama Buddha or Siddhartha Buddha) who trended the concept of non violence around the globe. The Buddha of Enlightenment is the founder of Buddhism, also known as "The Awakened One". The Buddha while fasting under the Bodhi Tree attained Nirvana, or the ultimate form of divine knowledge. Today The Buddha Mind represents wisdom in it's purest form to all around the globe.As a LifeStyle Icon it can adorn any executive Desk with it's vision. A Gautama Buddha Idol alleviates suffering and brings purity to the soul by improving your karmic flow, which contributes to a better universe. This Brass Buddha Statue will radiate positive spiritual energy to aid you in following the Middle Path of the Buddha.This idol can be placed in your buddha shrine or on your corner table,it can inspire you towards your goals.As an Indian Handicraft it is embellished with stone jewels which radiate energy. Gift this to a loved one or enrich your Lotus Buddha Collection. Buy Sitting Buddha Statue in 10 inches Brass Cast embellished with semi-precious turquoise and corals, handcrafted at Buddha Bazaar by our local artists. This is a vision presentation from our Artist in Buddha Bazaar. Height: 10 inches, Length: 5 inches. Like the information on our Jewel Buddha Head, visit us here for more information on Buddhism.